Is Your Nonprofit Ready for a Marketing Revolution? If you’ve been following along on the Prosper blog for the last few weeks, you know we feel strongly that the time has come for the nonprofit sector to start a marketing revolution. Nonprofits of all shapes and sizes are experiencing massive change, and in some cases, massive struggles. More organizations are competing for fewer dollars. Traditional funding streams are becoming less reliable. Donors and the way they give look very different than they did 10 years ago. Tax and government regulations have become increasingly uncertain. And the need from the communities nonprofits serve is greater than ever. Your organization can overcome challenges like these, but first, you’re going to have to totally change the way you approach marketing. If your organization is still treating marketing like it’s a dirty word, or limiting it to the soft and fluffy world of “awareness-building,” you’re going to have to make a change if you want to survive, grow and make an impact. The good news is that a small group of extraordinary organizations are bucking the status quo and redefining the role marketing plays in advancing their mission. They’re turning marketing into a true force for social change, and their forward-thinking approach can be a great model for the rest of the sector. That’s why we recently hosted a webinar in partnership with Independent Sector featuring special guest Brian Frederick, Vice President of Communications at the ALS Association. 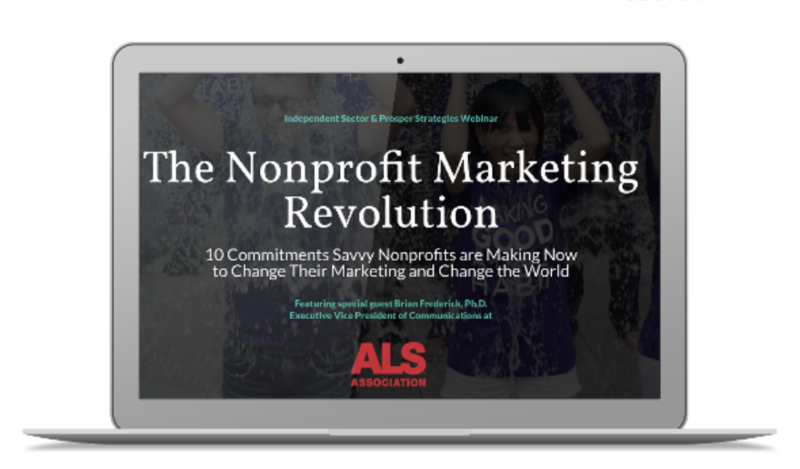 Following their wildly successful Ice Bucket Challenge, the ALS Association transformed marketing from an awareness building tool to a mission-advancing tool, and in our recent webinar, Brian told us all how they did it. This webinar is one of a series of 13 that will be hosted by Prosper Strategies and Independent Sector throughout the year around the 10 commitments in the Nonprofit Marketing Manifesto. See the full schedule here and fill out the form if you want to be automatically registered for all sessions. Our Nonprofit Marketing Revolutionaries Mastermind is the first peer group program of its kind, designed to help nonprofit leaders like you transform your organization’s marketing function into a tool for mission advancement and social change. By the end of the year, your organization will have totally transformed its approach to marketing, and you’ll be making a greater impact than you ever thought possible. Applications are due by Friday, December 21st, 2018, selected participants will be notified by Friday, December 28th, and monthly mastermind sessions will begin in January 2019. We’ll then open a waiting list for next year. Click here to apply to our Mastermind Group and transform your marketing approach! Here’s to the start of your marketing revolution.